Partnering with influential bloggers helped gain additional support. The Consumer Healthcare Products Association (CHPA) had a simple message to deliver during National Poison Prevention Week. CHPA, which represents manufacturers and marketers of over-the-counter medicines and dietary supplements, wants consumers to keep OTC medicines out of the reach of children. 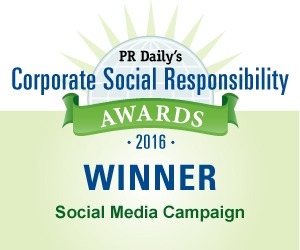 Its campaign to get this message out has earned CHPA and its communications agency SOMA Strategies a first place award for “Best Social Media Campaign” in PR Daily’s 2016 Corporate Social Responsibility Awards. Armed with data showing that some 60,000 children wind up in emergency rooms after accidentally taking medicines, the organization sought a way to use its limited resources to reach as many people as possible. With mothers of young children as a specific target, the CHPA turned to channels it knew this audience used: Instagram and Twitter. When the campaign started, the association had fewer than 70 followers on Instagram. Between Twitter and Instagram, CHPA generated more than 22 million impressions with a series of compelling graphics. Additionally, campaign hashtags were retweeted at an 83 percent rate. People “liked” the posts more than 17,000 times and left more than 2,000 comments. Shares expanded beyond the social networks where the graphics were posted, with people “pinning” posts to Pinterest and sharing them on Facebook nearly 2,000 times. And that Instagram account? Its follower count grew an astounding 11,617 percent. In addition, CHPA partnered with seven influential bloggers, including Mommy Shorts, which boasts two million monthly readers; Mommy Shorts also shared content on her own Instagram channels. The results are more consistent with big-budget campaigns, but the CHPA had only $25,000 to spend. Because that money was so effectively invested, congratulations go to Colleen Creighton and Elise Wingate from CHPA, and Monica G. Sakala from SOMA Strategies. View More Corporate Social Responsibility Awards 2016 Winners.